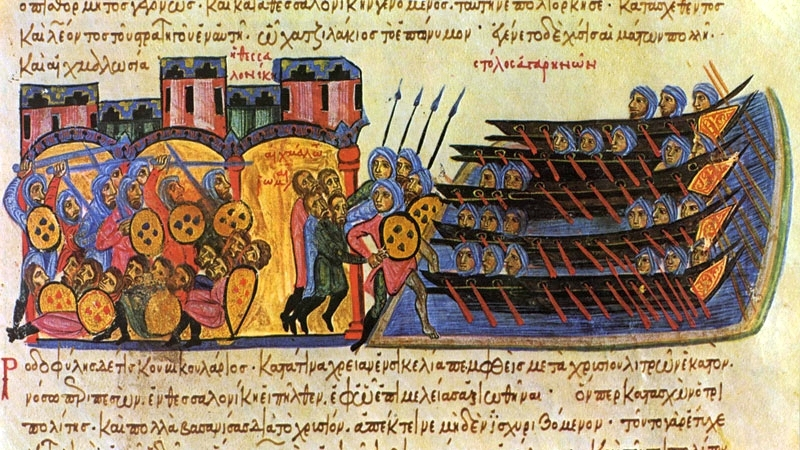 Thessaloniki, one of the largest cities of the Byzantine empire in the early tenth century, was captured and pillaged in 904 by a Muslim force led by Leo of Tripoli. The following account of the short siege comes from John Kaminiates, who was captured and taken as a prisoner with his father and brothers. He wrote a letter to Gregory of Kappadokia while he was in captivity, concluding it around the end of September 905. Prior to this section, John Kaminiates gives a detailed description of Thessaloniki and its defences, then reveals that information has come to the city that a naval force under Leo of Tripoli (numbered at fifty-four large galleys by other sources) has turned away from an attack on Constantinople and is headed to his city. Preparations are quickly made, with one person named Petronas leading the efforts to strengthen the harbour defences. He was constructing an underwater barrier, known as porporella, which Kaminiates believed would have been able to fend off the attack, but when the military command was taken over by a strategos named Leo Chitzilakes, this plan was abandoned in favour of raising the sea walls. A second strategos named Niketas was also sent by Emperor Leo VI to Thessaloniki, but in a tragic incident, when he met Leo Chitzilakes they were both on horseback and Leo’s mount unexpectedly threw the rider off, seriously injuring Leo and leaving him unable to be of any use for the upcoming siege. The account given below begins while Kaminiates describes the prayers that were being undertaken to ask for protection of the city. Chapter 23: While we were thus exerting ourselves in vain, someone arrived with the news that the ships of the barbarians were already nearing the neck of land described as the ‘Jetty.’ This occurred at daybreak on Sunday the 29th of July in the six thousand four hundred and twelfth year of the Creation of the World (AD 904). The report spread like wildfire through the city and there was turmoil, din and confusion on all sides, as people shouted out now one thing now another, trying to decide what to do about the immediate situation, and everybody armed himself as best he could and hastened to man the walls. And they were not yet properly deployed along the battlements, when the barbarian fleet appeared in view from the previously mentioned promontory, in full sail. And it so happened at the time that the ships were driven by a tailwind in such a way as to create the impression that they were not gliding over the surface of the water but floating through the air. It was, as has been remarked, the month of July, a time of year when the wind that blows across the Gulf (of Thessaloniki) is at its most sustained, blowing from the foothills of Mt. Olympus in Greece, and each summer day from daybreak to the ninth hour falling upon the city and causing a breeze. And so, with the wind abetting them in the first moments of daylight, the enemy swooped down from close by. First of all, they lowered the sails, having positioned themselves alongside the wall, and began to take careful note of the layout of the city. They did not, in fact, offer battle as soon as they had dropped anchor but left some time in order to probe our strength and the extent of our preparedness and to equip themselves for combat. They stood for a while filled with apprehension, unable to compare the spectacle that now confronted them with anything they had seen before: what they saw was a city of considerable dimensions with the entire course of its wall manned by great numbers of people. Consequently, they were even more dismayed and held back for a short time from giving battle. We, for our part, began to pluck up courage and in the short ensuing respite to restore our morale. Chapter 24: While we were in this situation, the leader of the barbarian forces decided to patrol the entire section of the wall that is washed by the sea. He was a sinister and thoroughly evil person, who flaunted a style of behaviour singularly appropriate to the wild animal after which he was named and for whose ferocious ways and ungovernable temper he was more than a match. Assuredly, you yourself also know the man by reputation, a reputation which celebrates his wickedness with the claim that he has outshone all previous paragons of impiety by descending to such depths of madness as to gaze insatiably upon the spilling of human blood and to love nothing better than the slaughter of Christians. He too was once a Christian, was reborn in the saving grace of baptism and taught the precepts of our religion. But when he was taken prisoner by the barbarians, he embraced their impiety in exchange for the true piety of the faith and there is no way in which he more eagerly seeks to ingratiate himself with them than by making his deeds conform to his name and by taking a particular pride in flaunting the actions of a felon and a brigand. And so Leo, this untamable beast, this felon, sailed around the wall gazing intently and searching out with studied malice a possible point from which to launch his attack. The other ships dropped anchor at a single point on the eastern shoreline and began to make their preparations. Our citizens also donned their armour, manned the battlements and braced themselves for the ensuing contest. And truly it was a contest – the great contest which had been so loudly proclaimed, not the mere trial of strength of a wrestler competing against his opponent for the applause of the spectators, not a contest that offers a material reward and holds out a fleeting moment of enjoyment for the winner or the simple stigma of defeat for the loser; what was at stake was whether so great a city would win the unparalleled distinction of surviving so great a danger or suffer the inconsolable grief of in some way succumbing to the fate that menaced her. Chapter 25: But when that wild beast had surveyed the entire extent of the wall and had noticed that the entrance to the harbour was barred by an iron chain and obstructed by the sunken hulks of a number of ships, he decided to launch his attack just at those points which he perceived to be free of those blocks of stone which, lurking on the seabed where they had earlier been placed, impeded the access of his ships and where his fleet would not be under heavier fire from that part of the wall which had already been built up to some considerable height. He chose a location, in fact, where a great depth of sea water beat against a particularly low stretch of wall, made a careful note of his position, and then, returning to his men, gave the signal for battle. They swooped down with their ships towards those points which had been described to them, letting out harsh and savage cries and rowing furiously in the direction of the wall. And banging on rawhide drums, they raised a fearful din, and they tried with many other kinds of bluff to frighten the defenders on the battlements. But those who were manning the wall shouted back even louder and invoked the aid of the saving weapon of the cross against the enemy forces. And they did this to such an effect that the barbarians, at the sound of so many people uttering a cry more fearsome than any they had previously heard, were dazed for a while and did not expect to achieve anything. Estimating the numbers of the citizens from the loudness of their shouts, they concluded that it would be no easy matter to enter the fray against such odds and to sack so great a city, the like of which they had never seen. Nevertheless, in order not to create the impression of having lost their nerve at the start of their offensive, they advanced neither fearlessly, nor with the rage which they later displayed, but with a certain blend of frenzy and fear, protecting themselves against their opponents by means of a barrage of missiles. Then their approach became more reckless and they strove to bring the fighting nearer, rousing themselves to fury like barking dogs and thoroughly enraged by the weapons that were hurled down at them from the wall. The citizens, in fact, were anything but remiss in their use of archery, and used it to great and conspicuous effect by stationing all the Sklavenes [a southern Slav peoples] gathered from the neighbouring regions at those points from which it was easiest to shoot accurately and where there was nothing to deflect the momentum of their missiles. Chapter 26: But while both parties were shooting and being shot at, and neither side was gaining the upper hand, a detachment of barbarians, consisting no doubt of individuals bolder and more daring than the rest, leaped overboard. They took with them a wooden ladder, which they propelled through the water and with which they attempted to scale the wall, paying no heed to the weapons discharged against them from that quarter. In fact, they kept their bodies underwater until they got close up and swam in holding their shields over their heads. Once they got near, however, left without the protection afforded by the water and using their shields to cover their heads, they struggled manfully against a rain of missiles. Then, rapidly drawing up the ladder against the rampart, they tried to scale the wall. But death forestalled their plan and before they could form a clear idea of how to carry out their scheme they lost their lives. No sooner, in fact, had their feet touched the rungs of the ladder than a volley of stones as thick as hail was unleashed against them, toppling them off and sending them headlong to a watery grave. Whereupon the ships all drew back quickly, not daring for the time being to venture anything further of the kind. They resorted, instead, to discharging from a distance a hail of missiles that darkened the air, but they too came equally under fire from well-aimed shafts that rarely missed their mark and from shot from the stone-throwing engines, the mere sound of which as it whistled through the air struck terror into the hearts of the barbarians. Chapter 27: Already Niketas, who has been mentioned before, the one who had been sent by the emperor, was hurrying up and down the entire length of the wall, encouraging the people in the following words: ‘Men of Thessaloniki, I held a different opinion of you before this moment and would not have considered you to be so gallant and daring in action, since you had neither been put to the test nor had you proved yourselves in this sphere in the past. But now the present crisis has afforded an occasion for entertaining high hopes of you. I see that you all have strong bodies and stout hearts, that you are wholly committed to the present action, that you scorn the enemy and that you gallantly brush aside their ruses. You are quite right to do so. For the struggle concerns you yourselves, men of substance and of principle, and it concerns the rest of the city, whose title to fame has no serious contender. If you prove superior to the present peril you will become a fitting object of praise in the estimation of all men. But should you suffer some reverse and succumb to the threats of the barbarians, there will be nothing to which one can liken the extent of your misfortune and the depth of your shame. Therefore, stand your ground courageously and endeavour to secure victory for your native city and for yourselves and do not turn and flee from the enemy, lest, having for the sake of one small moment of weakness placed yourselves in such terrible danger, you leave behind you a novel tale for posterity to tell.’ With these fighting words he encouraged the people and went the rounds, instilling no small degree of confidence into the hearts of all. And the strategos [Leo Chitzilakes], as though oblivious of his own affliction, though it was grievous (resulting as it did from the fall that we related earlier) and unbearably painful, also went around, mounted on a mule, not sitting astride it but sidesaddle, to the extent that the pains in his shattered limbs permitted. He posted the more stalwart members of the imperial guard at certain vital points along the wall, so that for their part they might also spur on those near them to imitate their actions, and thus dispose them to battle. Chapter 28: The barbarians attacked not once but several times in the course of that day, but they suffered more casualties than before and withdrew. At a preconcerted signal they suspended operations at sea, retired with their ships and dropped anchor beside a stretch of coast to the east of the city. Then they disembarked and began to shoot at those who were positioned on the high section of wall where the so called ‘Rome Gate’ stands, close to the sea. They fought there until late into the night and then, apparently fatigued by their exertions, rested on board their ships; though perhaps they were exercising their minds how best to attack us on the following day and were intent on preparing a further series of treacherous and deceitful moves. No sooner, therefore, had we paused a moment from the heat of battle than we were thrown into a further state of anxiety over the level of vigilance maintained by the troops manning the fortifications that ringed the city and the suspicious movements of the barbarians, movements which might be the prelude to a successful ambush carried out under cover of darkness that would allow them to penetrate our defences undetected and thus encompass our destruction. They are in fact extremely clever in this area, and once they have decided to act, they act decisively. Moreover, they are ready to brave any danger as long as they can make a start of putting their plans into action. And even if their plans miscarry, they consider it a glorious achievement to struggle boldly to accomplish what for the time being proves incapable of fulfilment. Accordingly, we stayed awake all that night, even though we had every reason to be proud of our exploits to date. In fact we had displayed a degree of raw courage that had astonished even the leader of the barbarians, who subsequently made a point of learning the reason why we had resisted each attack so valiantly and of ascertaining how things had turned out to be the reverse of what he had heard about us, so that his own expectations had been completely overturned. Chapter 29: But when daybreak came and announced the second day of fighting, the strategoi [Leo Chitzilakes and Niketas] once more went to great lengths to put us on our mettle and prepare us for action. As the sun’s rays spread daylight over the air, the barbarians disembarked and launched a further attack against the wall. They deployed, distributing themselves along certain points in battle formation. And concentrating their greatest numbers on the openings in the wall where the gates stood, they brought the full weight of their weapons to bear against us. Some used bows and arrows, others the handmade thunder of stones. Others applied themselves to stone-throwing engines and sent giant hailstones of rock hurtling through the air. Death threatened us in many shapes, and since it came from all directions, it lent a further dimension of terror to the experience of those who happened to be nearby. Against the already-mentioned gate alone they placed seven stone-throwing engines heavily protected on all sides, which they had previously equipped specially for this purpose during their progress by way of Thasos. In front of these they brought up wooden ladders, which they placed against the wall and tried to climb up, providing themselves with cover by means of a barrage of stones from the stone-throwing engines, whose relentless fire made it impossible for anyone to venture forth with impunity on to the wall. And already they had attached a ladder to the battlements of the outwork and their plan would have been realized, had not a heavenly power given certain daring men the strength to leap down on to the spot. They wounded the barbarians with their spears and sent them pitching backwards together with the ladder. When they saw that this strategem too had failed, they fled and even left the ladder behind. We were so far emboldened as to mock them and to hurl missiles at them and stones from the stone-throwing engines even more eagerly than on the day before. And we no longer allowed them to get anywhere near the wall for even a short time, even though they were kindled to greater fury and sharpened their tusks like wild boars and would have torn us up alive with them, had it been possible. How terrifying it was to hear them raving like maniacs against us! What towering fits of anger they displayed, when they gnashed their teeth furiously and their demonic nature was revealed by the way they continually foamed at the mouth! Nor would they take any food throughout the entire course of that day but were insatiable for battle in spite of the tremendous heat. Indeed they were not even vaguely aware of the fact that their own bodies were broken with fatigue and scorched by the sun which was beating down on their heads. Their one preoccupation was either to sack the city and vent their rage upon us or, in the event of failure, to despair of life and to dispatch themselves with their own weapons. For once the wrath of the barbarians has been kindled, it is borne along by an unreasoning impulse, and will not desist until it witnesses the shedding of its own or its opponent’s blood. Chapter 30: But since it was highly dangerous for them to approach the wall, they relied exclusively on missiles and on stone-throwing engines. Drawing themselves up in rows, they took their stand some distance away yet near enough for their shots to fall upon the city with undiminished force. Protecting themselves with their shields and throwing their entire being into the struggle, they stood like statues with bodies of bronze or some other hard material and displayed limitless qualities of endurance and a fighting spirit that defied description. And in fact, when the sun was in its noonday course, when more than any other time of day it heats the air up like a furnace, they kindled their inborn fury with that last extreme of heat and goading their irrational frenzy still further with the stimulus of despair, they threw all their energies into a different (and particularly deadly) kind of siege. There were four gates in the wall on the east side of the city. Two of these, the previously mentioned Rome Gate, and the so-called Kassandreiotic Gate, they planned to burn down. The idea was that, if they could penetrate the outwork when the outer gates were burnt down and creep up to the high wall, they could wreck the inner gates without having anything to fear and pen everyone up in the city by posting expert archers opposite the wall to shoot their arrows continually and prevent anyone inside from venturing out. Chapter 31: They set about their cunning plan in the following way: They found carts on which they placed upside down very small boats of the kind our fishermen use to fish with, adding a great quantity of firewood and a pile of brushwood. Then they sprinkled it all with pitch and sulphur, put their shoulders to the carts, set their wheels in motion and guided them with their hands until they reached the gates. Then they lit the wood from underneath and covering themselves with their shields, went back to the archers, having carried out their plan unnoticed. The fire took hold of the wood, feeding its flame until it flared up and caused the outer surface of the gates, which were iron-plated, to turn white-hot. Then the white heat, spreading inwards, reduced the gates to a sheet of flame, so that in a short time they collapsed, which threw everyone into a state of abject fear. No sooner was the news reported throughout the city that the gates had been burnt down than the effect was as though everyone had been stabbed through the heart; such was the state of terror and dejection to which people were reduced, as the colour drained from their cheeks, and as they abandoned abruptly every confident expectation. And those who a short while ago had been leaping down from the walls and keeping the enemy at bay and exhorting others to join in the fray were showing themselves in actual fact to be feebler than hares. The mere fact that that cunning expedient had succeeded gave more than a hint to everyone of what might be the end. Nevertheless, now that the outer gates had been destroyed by fire, we quickly protected the inner ones with a new wall. And we put water in containers on the battlements and kept a close watch in case the enemy should by any chance launch an attack against these gates too, so that when they tried to cause further damage, we might have some means of contending with the flames and preserving the gates from their treacherous designs. When they realized this, however, they no longer resorted to these particular evil tactics. Yet by resorting to other tactics still more cunning and more violent, they were destined to bring about our destruction by a means so effective and so far surpassing all contrivance that it was henceforth in no wise possible to stave it off. They employed this pause in their incendiarism by shooting at us with stone-throwers and with bows during the rest of the day until darkness succeeded daylight and put an obligatory stop to their exertions. Chapter 32: Then, when they had stopped fighting, they went aboard their ships and after a brief spell of inaction, they began to carry out the plan of attack they had cunningly contrived beforehand. The plan involved a peculiar kind of gamble. If, thanks to it, they should be able to sack the city, they would have an easy success since there is no more effective siege tactic in existence, especially when the offensive is conducted from the water with no intervening dry land to cramp one’s style. But if, along with their previous ventures, this too were to fail, they would first dispatch with their weapons those who had put the idea into their heads and had made them sail so far to no purpose, and then would return home. Having agreed, therefore, upon this plan, they began early in the night to put into effect their complicated scheme. Lighting lamps everywhere, they coupled the ships together in adjacent pairs and lashed their sides together with stout cables and iron chains so that they would not easily drift apart. Then they hoisted by means of the rigging at the fore the pieces of wood that stand up in the middle, which sailors call masts, and attaching by their handles to these the steering-paddles of each ship, they slung them high up in the air across the ropes leading to the prow so that their blades projected beyond the side of the ship. The result was a remarkable and novel contraption. For when the steering paddles had been suspended aloft by their handles in the manner described, they placed long strips of wood over them in rows, one next to the other, flooring in by this ingenious method the intervening space. They then fenced in the edges on all sides with boards, and secured the ends of the steering-paddle handles by making them fast to very strong cables at the stern end of the ships. In this manner they devised towers that were more effective than those surmounting walls on dry land. In them they posted armed barbarians, an elite force mounted aloft on account of their physical strength and natural daring and destined to deal us the coup de grace. They ordered some to shoot arrows, others to fling large stones (big enough to fill a man’s hand) at those manning the inner circuit of the fortification. Others were equipped with fire (it too artificially contrived) which had been prepared in advance in earthenware vessels and which they were instructed to hurl at those advancing to confront them. All these expedients were effective and appropriate because they no longer had to operate on land but, thanks to the devilish invention already described, had been placed on a higher level than the structure of the fortification and they were thus provided with a useful vantage point for the accomplishment of their evil designs. Chapter 33: But when on that same night these impious men had brought all their preparations into effect and no detail of what was being done escaped our notice because, as has been pointed out, they had plentiful illumination and the beach on which they had forged ahead with their plans was nearby, all of us were overcome by fear and consternation, not knowing how to preserve our safety for the future. One could see that the entire population was in a state of utter confusion and helplessness, unable to make up their minds from one moment to the next, and that their very lives were in jeopardy. There was indeed no concern to ward off impending disaster, only a morbid obsession with the question of how soon and how painfully death would occur. Flight was no longer an available or a safe option with the barbarians occupying positions all around the wall and keeping a close watch on the gates. Yet the danger that met the eye made waiting out of the question. Abandoning all hope of safety, they walked as though dazed up and down the wall, completely overwhelmed by the magnitude of their misfortune. But some, in whose hearts the flame of courage had not been entirely extinguished, decided while waiting for the enemy to make some preparations to defend the wall and repel their advance. These consisted of pitch, firebrands, quicklime and other flammable substances got ready in earthenware vessels for possible use against ships riding at anchor, the idea being to hurl these objects in their midst and put them out of action. Chapter 34: Nevertheless, these were the actions and decisions of bewildered men. Already the light of day was dissolving the darkness of night, when to and behold! The ships, distributed at several points according to their equipment, crashed against the wall, presenting to the eyes of all a novel and extraordinary spectacle. Each pair of ships brought along its own ingeniously constructed wooden turret, which hugely overtopped the structure of the fortification and held aloft its freight of barbarians leaping up like frenzied bulls and threatening everybody with destruction. Whereupon, all that part of the population of the city that had come to think nothing of death, since it was both inevitable and staring them, so to speak, in the face, threw themselves unreservedly into the struggle. Making of the moment of maximum danger an occasion for displaying their courage, they stood their ground and fought like heroes; every man did his utmost. In fact, they did not allow the ships to get anywhere near, but by showering them with missiles and firebrands, they prevented them from approaching the wall and putting their plans into effect. But those who were smitten with cowardice and in their utter helplessness lacked the strength to even consider the experience of misfortune let themselves down gradually from the wall and fled to the mountainous part of the city, giving further encouragement thereby to the enemy. When, in fact, the latter saw that the structure of the wall was in a more serious state of disrepair in one place than anywhere else (it was the spot where we had earlier erected wooden breastworks), and noticed also that the sea was deeper just at that point, they propelled in that direction one of the pairs of ships that had been lashed together, rowing gently until they got near and had brought the bows of the ships right up to the battlement. Then, when the men on the wooden fortifications tried to hurl stones at them, the barbarians who were standing on top of the contraptions previously described uttered a loud and raucous cry, let fly with huge stones (which were not just big enough to fill a man’s hand this time but were absolutely enormous) whose impact none could withstand, blew fire by means of air through tubes, hurled other receptacles also filled with fire into the fortifications and struck such terror into the hearts of the defenders that they leaped down swiftly and took to their heels, leaving the entire stretch of wall deserted. When the enemy saw that they had achieved their end (the defenders had all fallen to earth like leaves in the wind, not alighting by means of ladders but crashing down in terror) they sent against the fortifications a particularly daring barbarian with the complexion of an Ethiopian, who was apparently more frenzied than the others. He had a sword in his hand, which he brandished as he leaped down from the wall. Then he waited for the crowd to surge forward, trying to discover whether they had made off in feigned or in genuine flight. For they suspected that the inhabitants might have laid some hidden ambush for them in the streets, in order to waylay them once they had split up into separate groups. Consequently, they were reluctant to enter the city, and set about their task without first taking precautions. But then (it was the third hour of the day) the glint of swords brandished by barbarian hands flashed like lightning through the air and revealed at every point the entry of the enemy. Beholding that disaster had well and truly struck, people all began to mill about in different directions, herded together by death, which loomed over them and left no further loophole for escape. Chapter 35: Then, when the barbarians saw that the entire wall had been cleared and that the mass desertion of its defenders now guaranteed their safety, they sallied forth eagerly from the ships, leaped down on to the battlements and set fire to the gates, thus signalling to the other ships that their mission had been accomplished. These too hove swiftly into sight and dispatched against the city their contingents of barbarians, naked except for a small loincloth, and armed with swords. Once these barbarians were inside, they slew all those whom they found writhing about on the ground in the vicinity of the wall, regardless of whether they found them prostrated and paralysed with fear and so unable to move or languishing without any hope of flight owing to the injuries they had sustained during their earlier falls. After that they split up, and moved down the main thoroughfares. This section comes from John Kaminiates: The Capture of Thessaloniki, edited and translated by David Frendo and Athanasios Fotiou (Australian Association for Byzantine Studies, 2000). We thank the Australian Association for Byzantine Studies for allowing us to republish this section. This entry was posted in Primary Sources and tagged 10C, Byzantine, Islamic, Muslim, sieges. Bookmark the permalink.